Ongoing ocean warming and acidification increasingly affect marine ecosystems, in particular around the Antarctic Peninsula. Yet little is known about the capability of Antarctic notothenioid fish to cope with rising temperature in acidifying seawater. While the whole animal level is expected to be more sensitive towards hypercapnia and temperature, the basis of thermal tolerance is set at the cellular level, with a putative key role for mitochondria. This study therefore investigates the physiological responses of the Antarctic Notothenia rossii after long-term acclimation to increased temperatures (7°C) and elevated P CO2 (0.2 kPa CO2) at different levels of physiological organisation. For an integrated picture, we analysed the acclimation capacities of N. rossii by measuring routine metabolic rate (RMR), mitochondrial capacities (state III respiration) as well as intra- and extracellular acid–base status during acute thermal challenges and after long-term acclimation to changing temperature and hypercapnia. RMR was partially compensated during warm- acclimation (decreased below the rate observed after acute warming), while elevated P CO2 had no effect on cold or warm acclimated RMR. Mitochondrial state III respiration was unaffected by temperature acclimation but depressed in cold and warm hypercapnia-acclimated fish. In both cold- and warm-exposed N. rossii, hypercapnia acclimation resulted in a shift of extracellular pH (pHe) towards more alkaline values. A similar overcompensation was visible in muscle intracellular pH (pHi). pHi in liver displayed a slight acidosis after warm normo- or hypercapnia acclimation, nevertheless, long-term exposure to higher P CO2 was compensated for by intracellular bicarbonate accumulation. The partial warm compensation in whole animal metabolic rate indicates beginning limitations in tissue oxygen supply after warm-acclimation of N. rossii. Compensatory mechanisms of the reduced mitochondrial capacities under chronic hypercapnia may include a new metabolic equilibrium to meet the elevated energy demand for acid–base regulation. New set points of acid–base regulation under hypercapnia, visible at the systemic and intracellular level, indicate that N. rossii can at least in part acclimate to ocean warming and acidification. It remains open whether the reduced capacities of mitochondrial energy metabolism are adaptive or would impair population fitness over longer timescales under chronically elevated temperature and P CO2. Recent studies have demonstrated warming of the worlds’ oceans, and the Antarctic Peninsula also experiences a continuous increase in temperature [1–6]. Additionally, anthropogenic CO2-emissions accumulate in the atmosphere and the oceans  and result in a decrease in seawater pH (ocean acidification) [8–10]. Both ocean warming and acidification exert their specific effects on the marine fauna. Studies identifying the capacity of Antarctic fish to cope with thermal challenges [11–17] contributed to the concept of oxygen and capacity limited thermal tolerance, which explains the limits of thermal tolerance through limitations in tissue functional capacity and the associated oxygen limitation at high and low temperatures [13, 18, 19]. Changes in seawater temperature particularly affect cold stenothermal organisms, which generally possess extremely slow metabolic rates and poor acclimation capacities, when compared to temperate species [20, 21]. While temperate ectothermic vertebrate and invertebrate species are apparently capable of shifting their temperature limits by acclimation , this feature and the potential interaction between effects of warming and increasing ocean acidification have been insufficiently explored in Antarctic fauna [11, 23–25]. As stenothermal Antarctic fish are assumed to perform well only within their narrow environmental temperature range [15, 26], the question arises whether these species can acclimate to increasing temperature and rising ocean P CO2. Whole animal oxygen consumption rates reflect the energy demand of the organism as the sum of all physiological costs, including ion and acid–base regulation . Under changing abiotic conditions, the rate of all or some of these processes may change, causing an increased or decreased overall demand for ATP. Therefore, the functional properties of mitochondria as the sites of energy (ATP) production may play a key role in shaping whole organism thermal tolerance and limits of aerobic metabolism [13, 27, 28]. However, the studies on mitochondrial respiration and capacities of Antarctic invertebrates [29, 30] and fish [12, 28, 31–33] have so far not addressed changes in mitochondrial respiration after long-term acclimation to increased temperature or P CO2. Increasing seawater P CO2 levels are hypothesized to narrow an organism’s thermal windows, possibly by limiting the ability to compensate for changes in acid–base status at thermal extremes [34–36]. Changes in acid–base status affect whole organism, cellular and molecular functions. Findings in teleost fish range from high compensatory abilities for rising seawater P CO2[37–39], to incomplete compensation with a long-term reduction in pHe. Less is known about the response of intracellular pH (pHi) to changing temperature or hypercapnia in both marine vertebrates and invertebrates [41–44]. The intracellular proton buffering capacity of vertebrates is found to vary markedly between animal species, tissue type and aerobic capacity [45–48]. Especially studies on intracellular acid–base status in Antarctic fish are scarce . The Antarctic fish species N. rossii is an abundant member of coastal Antarctic communities [50–52] and is widely distributed between 45° and ~ 62°S [53, 54]. Water temperatures around the Antarctic Peninsula, e.g. in Potter Cove at King George Island, range from −2°C in winter to 2°C in summer . N. rossii is adapted to this narrow thermal range and may display a limited resistance and acclimation capacity to warming compared to more eurythermal fish species. The aim of this paper is to investigate the acclimation capacities of relevant components in aerobic metabolism of the Antarctic notothenioid N. rossii at increased seawater temperature and P CO2. In an integrative approach, we investigated acclimation to warming (7°C) and hypercapnia (0.2 kPa CO2) at different organisational levels, the whole animal, extracellular (blood) and intracellular, and the mitochondrial level. We exposed the animals to various abiotic conditions and then focused on changes in the fish’s condition and haematological parameters, and on oxygen consumption as a measure of routine metabolic rate (acute and after long-term acclimation). As a next step, we analysed mitochondrial acclimation and adaptation capacities (mitochondrial state III respiration, cytochrome c oxidase activity) as indicators of the plasticity of whole animal metabolic rate. Finally, we determined extra- and intracellular acid–base parameters in N. rossii as a measure of acid–base regulation patterns and capacities, and related them to the findings of reduced mitochondrial capacities under hypercapnia. Demersal marbled rockcod, N. rossii, were caught in December 2009 in Potter Cove, King George Island, Antarctic Peninsula (62°14’S; 058°41’W) during the Antarctic summer season (seawater temperature 0.8°±0.9°C, salinity 33.5±0.2 psu). Fish were collected using baited traps (length 124 cm, width 64 cm, height 56 cm, mesh size 25 mm) and trammel nets (length 15 m, inner mesh 25 mm). Animals were reared and acclimated in the aquaria facilities at Dallmann Laboratory, Carlini Station (formerly Jubany Station, King George Island) with direct seawater supply from the cove, under natural light conditions. Following the Intergovernmental Panel on Climate Change’s “business-as-usual” scenario, atmospheric CO2-concentrations may exceed 0.2 kPa by the year 2200 [8, 56]. Therefore, we chose 0.2 kPa CO2 for our hypercapnia acclimation of N. rossii. For acclimation, animals were randomly selected and acclimated to 1°C, 0.04 kPa CO2 (control group, n=9, mass 155–804 g; total length 25–39.4 cm), 1°C, 0.2 kPa CO2 (cold hypercapnic group, n=10, mass 144–510 g; total length 23.8-32.8 cm), 7°C, 0.04 kPa CO2 (warm normocapnic group, n=5, mass 151–412 g; total length 23.6-33.9 cm) and 7°C, 0.2 kPa CO2 (warm hypercapnic group, n=10, mass 137–504 g; total length 21.4-31.3 cm). Animals were fed to satiation twice per week with chopped fish muscle and snails. For all acclimations, seawater temperature (from 1° to 7°C) and P CO2 (from 0.04 kPa CO2 to 0.2 kPa CO2) were both increased stepwise (1°C/4 hours; 0.01 kPa CO2/h) over 24 hours. Total acclimation time was 29–36 days. Experimental animals were acclimated in well-aerated (>95% O2 saturation), 150 liter tanks, fed by an additional 150 liter header tank. This header tank was used for a daily water exchange of 150 liter to avoid alteration of the conditions in the acclimation tanks. For the warm normocapnia/ hypercapnia acclimations, temperature was kept constant using a 250 W heating element (Jaeger, EHEIM GmbH, Germany), controlled by a Temperature Controller TMP1380 (iSiTEC GmbH, Germany). For the cold/ warm hypercapnia acclimations, higher P CO2 was regulated by an iks aquastar system (iks ComputerSysteme GmbH, Germany). The system maintained constant pH (accuracy ± 0.05 pH units) by controlling a solenoid valve (Aqua Medic GmbH, Germany), which bubbles the acclimation tanks with pure CO2. Specific seawater conditions are given in Table 1. pH of all acclimation systems was measured daily with a WTW 340i pH meter (WTW, Germany. Electrode: WTW SenTix HWS) and calibrated daily with NBS (WTW, Germany) buffer. Total CO2 (CCO2) in the seawater was determined with a carbon dioxide analyser (Corning 965, CIBA, Corning Diagnostics, England). Seawater carbonate chemistry was calculated with the measured pHNBS and CCO2 using the CO2sys software . All experiments were conducted at Dallmann Laboratory (Carlini Station), King George Island, Antarctic Peninsula. Routine metabolic rate (RMR) of N. rossii (control/ after acute temperature elevation/ long-term acclimated) was measured via intermittent-flow respirometry. Following Johnston et al. , fish were not fed for 10 days prior to the respiration experiments. After the acclimation period, each fish was placed in a 3500 to 4400 ml non-transparent, cylindrical respirometer placed within a 150 liter tank under acclimation conditions. Individuals were allowed to recover within the respiration chamber for 24 hours, a period considered appropriate to overcome the effect of any handling stress . A constant, circulating water flow in the respirometer was generated by an aquarium pump. In the intermittent-flow system, water exchange between chamber and ambient water was interrupted every 30 min for 15 or 30 min to measure oxygen depletion (max. 10% O2) by the fish within the chamber, then oxygen concentration was replenished to 100% by flush pumps. Oxygen concentration within the chamber was detected once per minute using a FiBox2 (PreSens – Precision Sensing GmbH, Germany) oxygen meter. The device was calibrated before each measurement in well-aerated seawater at the respective acclimation temperature, calibration at zero oxygen was conducted in nitrogen-bubbled seawater. In three individuals of N. rossii, oxygen consumption was measured before and after acute temperature increase. The same experimental setup as described above was used. After 24 hours of recovery, RMR was recorded for 24 hours under control conditions (1°C), then temperature was increased continuously by 1°C per hour up to 7°C. RMR was recorded at the beginning and at the end (7°C) of the acute warming period. Mean RMR were calculated over 24 hours, and thus represent resting metabolism including spontaneous activity. Blank measurements of bacterial respiration in the respirometer were carried out for each acclimation group, values for RMR were corrected accordingly. After measurement of RMR and at the end of the acclimation period, specimens of N. rossii were anesthesized with 0.5 g/l tricaine methano- sulphonate (MS 222). Blood was taken with a syringe from the caudal vein, the liver was taken for mitochondrial isolation. Parts of liver and muscle samples were immediately freeze-clamped and frozen in liquid nitrogen for pHi analysis, as described by Pörtner . Afterwards, individuals were killed by a spinal cut behind the head plates. The work was carried out according to the ethics and guidelines of German law. Experiments had been approved according to § 8 animal welfare act (18.05.2006; 8081. I p. 1207) by the veterinary inspection office, Bahnhofsplatz 29, 28195 Bremen, Germany, under the permit number Az. : 522-27-11/02-00 (93) on January 15th, 2008 (permit valid until Jan 14th 2012). The haematocrit of N. rossii was estimated in a blood subsample using a haematocrit centrifuge (Compur Microspin, Bayer Diagnostics Mfg. Ltd., Microspin, Ireland). Lactate concentration was measured with an Accutrend® Lactate tester (Roche Diagnostics GmbH, Germany). Osmolarity of the serum was measured after centrifugation of the blood for 10 min at 2000 g. For the measurement, a Vapour Pressure Osmometer 5500 (Wescor Inc., USA) was used. Immediately after excision, the liver was rinsed and total liver weight was determined before a subsample of liver tissue was taken, weighed and rinsed with 5 ml/g ice-cold isolation buffer containing 80 mM sucrose, 85 mM KCl, 5 mM EGTA, 5 mM EDTA, 50 mM HEPES and 1% w/v bovine serum albumin (BSA, fatty acid free) (pH 7.1 at 20°C). The liver tissue was then finely minced with scissors, suspended in 10 volumes ice-cold isolation buffer, and then put into a 30 ml Potter-Elvehjem glass homogenizer (VWR International, Germany) and slowly homogenised with three strokes at 80 revolutions/ minute. The homogenate was centrifuged (600 g, 10 min., 0°C), the supernatant collected and the pellet vigorously resuspended by vortexing in isolation buffer and centrifuged for a second time. Supernatants were then combined and centrifuged for 10 min at 11.000 g (0°C). The supernatant was discarded, any remaining droplets of fat removed with a cotton swab and the pellet resuspended in isolation buffer and centrifuged again. As a last step, supernatant was discarded again, and the pellet was resuspended in ice-cold mitochondria assay buffer (80 mM sucrose, 85 mM KCl, 5 mM KH2PO4, 50 mM HEPES, 1% w/v BSA (fatty acid free), pH 7,1 at 20°C) at 1 ml/g initial liver weight. This mitochondrial preparation was kept on ice away from light and used for mitochondrial oxygen consumption measurements. The mitochondrial protein concentration was determined according to Bradford  using a bovine serum albumin (BSA) standard, and considering the protein content of the mitochondrial assay buffer. Mitochondrial respiration measurements were conducted in two thermostatted perspex respiration chambers of 3 ml volume (World Precision Instruments, Inc., USA), equipped with an adjustable stopper and ports for the injection of metabolites and inhibitors and one for insertion of a TX micro-optode (PreSens – Precision Sensing GmbH, Germany), used for fluoroptic measurement of P O2. The oxygen traces were recorded with a PowerLab recording unit and Chart v5.5.6 software (ADInstruments GmbH, Germany). Mitochondrial respiration rates were converted to nmol O2*mg extracted mitochondrial protein-1*min-1. Measurements were carried out in assay buffer with a final volume of 1200 μl with mitochondrial concentrations adjusted to about 3 mg mitochondrial protein per ml, at 0, 6, and 12±0.1°C, respectively. Chamber temperature was maintained with a thermostat (LAUDA, Germany). Respiration was recorded and malate and pyruvate added to a final concentration of 1.3 mM and 1.6 mM, respectively, as substrates for complex I (state II), and ADP (final conc. 0.16 mM) was added to measure state III (max. slope). Then, 2 mM succinate was added as complex II substrate and 0.16 mM ADP for state III respiration. Frozen liver tissue was ground into powder by mortar and pestle under liquid nitrogen and homogenized in a glass homogenizer in 9 vol. buffer containing 20 mmol l-1 Tris–HCl, 1 mmol l-1 EDTA, 0.1% Triton X-100, pH 7.4, and afterwards with an Ultra Turrax (Silent Crusher M (Heidolph Instruments, Germany), followed by 10 min centrifugation at 1,000 g at 4°C. Cytochrome c oxidase (COX) activity was determined according to a protocol modified from Moyes et al. in buffer containing 20 mmol l-1 Tris–HCl, 0.05% Tween 20 and 0.057 mM reduced cytochrome c at pH 8.0. The decrease in extinction at λ = 550 nm through oxidation of cytochrome c (ε550 = 19.1 mol-1cm2) was monitored in a thermostatted spectrophotometer (Beckman, Fullerton, CA, USA) at 0, 6 and 12°C. Protein concentration of the tissue extract was determined according to Bradford , enzyme activity is given in μmol*mg protein-1*min-1. Measurement of pHi was carried out according to the homogenization technique developed by Pörtner . A solution of 1 mM nitrilotriacetic acid (NTA) and 160 mM potassium fluoride (KF) was used to keep the NTA concentration as low as possible. Cco2 was measured by gas chromatography (6890N Network GC System, Agilent Technologies), total CO2 in cell water was calculated according to Pörtner , assuming a fractional tissue water content of 0.78 . Intracellular acid–base parameters were calculated using the following, modified Henderson-Hasselbalch equation. Intracellular pK”’ and α (solubility) values were evaluated according to Heisler  using [Na+ = 0.02 M, [M] = 0.21 mol l-1, I = 0.12 mol l-1 and [Protein] = 220 g l-1. The tissue buffer values βNB for liver and muscle were adopted from Van Dijk et al. . Blood plasma pH (extracellular pH, pHe) was measured immediately after sampling at the acclimation temperature with a pH meter (WTW 340i, WTW, Germany. Electrode: InLab® Viscous, Mettler Toledo GmbH, Germany). The pH meter was calibrated daily with NBS buffers (WTW, Germany). Measurements were carried out in a closed microcentrifuge tube (0.5 ml) to minimize contact with environmental air. Plasma total CO2 (CCO2) was measured after centrifugation by means of a carbon dioxide analyser (Corning 965, CIBA, Corning Diagnostics, England). Blood carbonate chemistry was calculated using the modified Henderson-Hasselbalch equation (eqn. 3 and 4). Values for the CO2-solubility coefficient α and the negative logarithm of the dissociation constant K”’ were calculated after Heisler . The values required for the calculation (ionic strength, protein concentration, Na+ concentration) were adopted from Egginton . After heparinization of the blood (100 U/ml), the βNB capacity was determined at 0.5°C in a thermostatted tonometer. 1.5 ml of whole blood was equilibrated with different P CO2 (1 kPa, 2 kPa, 3 kPa CO2) for 1 hour before pH (electrode: InLab® Viscous, Mettler Toledo GmbH, Germany) and CCO2 were measured (gas chromatography: 6890N Network GC System, Agilent Technologies). The βNB capacity (−Δ[HCO3-]/ΔpH) was determined with values for Δ[HCO3-] calculated after equation 4. The respiratory control ratio (RCR) was calculated as the ratio between mitochondrial state III (complex I and II) and state IV (after ADP depletion) respiration. All data were tested for outliers at the 95% significance level using Nalimov’s test  as well as for normality (Kolmogorov-Smirnov) and homogeneity of variance. Differences in routine metabolic rate, mitochondrial oxygen consumption and COX activity at the assay temperatures 0, 6, 12°C, blood and intracellular acid–base variables, between the different acclimation groups were tested using unpaired, two-tailed t-tests and one-way analysis of variance (ANOVA, with Tukey post-hoc test). p≤ 0.05 was considered the significance threshold. All data are presented as means ± standard error of the mean (SEM). The relative liver weights (hepatosomatic indices, HSI), condition factors, haematocrits, blood osmolarities and lactate levels, as well as the blood acid–base parameters determined for control and acclimated N. rossii, are summarized in Table 2. The HSI showed a non-significant tendency to decrease after warm-acclimation of N. rossii in both the normocapnic (7°C, 0.04 kPa CO2) and the hypercapnic (7°C, 0.2 kPa CO2) groups. Acclimation to higher P CO2 at 1°C had no significant effect on the HSI. The condition factor of N. rossii, indicating nutritional status, was significantly decreased in the warm hypercapnic group. The haematocrit of N. rossii displayed no acclimation effect. Lactate concentrations in the blood, on average, remained below detection limit (<0.8 mmol*l-1). Only in the cold hypercapnic group, lactate was slightly elevated to 1.13±0.11 mmol*l-1. The blood osmolarity in N. rossii was significantly reduced in all warm and hypercapnia acclimated animals. Control: 1°C, 0.04 kPa CO2; warm normocapnia: 7°C, 0.04 kPa CO2; cold hypercapnia: 1°C, 0.2 kPa CO2; warm hypercapnia: 7°C, 0.2 kPa CO2. All values are given as means ± SEM. * indicate a significant difference to control conditions (t-test, p≤ 0.05). N. rossii exposed to acute warming (7°C) showed significantly increased, two-fold higher RMR compared to the control group (1.35±0.20 (control at 1°C, n=5) vs. 2.71±0.41 (acutely warmed to 7°C, n=3) mmolO2*kg-1*h-1), as displayed in Figure 1. Routine metabolic rate of N. rossii at different acclimation conditions. Oxygen consumption of control, cold hypercapnia (white bars), warm normocapnia/ hypercapnia (black bars)) acclimated fish, and after acute warming (1°C/ hour) to 7°C, normocapnia. All data are presented as means ± SEM, n= 3-6. * indicate significant difference of warm/ hypercapnia acclimation/ acute warming to control N. rossii (t-test, p≤ 0.05). Oxygen consumption in the control group and the long-term warm and/ or hypercapnia acclimated N. rossii was measured at the end of the 4-weeks acclimation period. In comparison to the control group, the RMR of the long-term warm and normocapnia acclimated fish was significantly increased at 7°C (2.23±0.16 mmol O2*kg-1*h-1 (n=5), Q10 of 2.38). However, after long-term warm acclimation RMR was significantly lower compared to that of the acutely warmed N. rossii at 7°C (Q10 of 3.2). RMR after cold hypercapnia acclimation (1.28±0.10 mmol O2*kg-1*h-1, n=6) was similar to that in control animals. Warm hypercapnia acclimation resulted in a significantly increased RMR (2.49±0.22 mmol O2*kg-1*h-1, n=5, measured at 7°C) compared to the control group measured at 1°C. No significant difference in RMR was found between the long-term warm normocapnic and the warm hypercapnic groups. Liver mitochondrial state III respiration increased significantly when assay temperature was changed acutely from 0°C (2.79±0.18 nmol O2*mg*min-1) to 6°C (5.64±1.17 nmol O2*mg*min-1) and 12°C (7.55±1.49 nmol O2*mg*min-1) in the control group (n=10), with similar rates in the warm normocapnic fish (n=5; 0°C: 3.86±0.19; 6°C: 5.53±0.34; 12°C: 6.55±1.62 nmol O2*mg*min-1). In cold hypercapnia (n=9; 0°C: 1.73±0.42; 6°C: 2.65±0.30; 12°C: 4.49±0.94 nmol O2*mg*min-1) and warm hypercapnia acclimated fish, state III respiration was significantly increased only at 12°C (n=9; 0°C: 1.95±0.36; 6°C: 3.89±0.85; 12°C: 6.40±1.50 nmol O2*mg*min-1) (Figure 2). 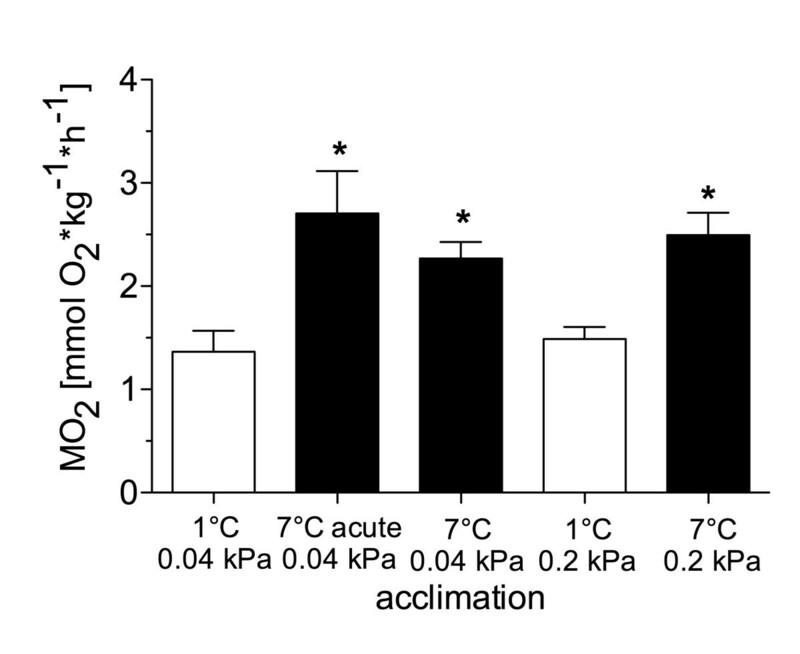 In the cold hypercapnic animals, state III respiration was significantly reduced (at 6°C and 12°C in the assay) compared to the control group. State III respiration rate in liver mitochondria of N. rossii . State 3 respiration was measured in the presence of malate, pyruvate, succinate and ADP at the respective assay temperature (0°C, 6°C, 12°C) in four different long-term acclimated groups; open circles: 1°C, 0.04 kPa CO2 (control); filled circles: 7°C, 0.04 kPa CO2 (warm normocapnic); open triangles: 1°C 0.2 kPa CO2 (cold hypercapnic); filled triangles: 7°C 0.2 kPa CO2 (warm hypercapnic). * indicate significantly higher mitochondrial respiration than at 0°C assay. ↓ depicts significantly reduced mitochondrial respiration in comparison to control acclimation (1°C, 0.04kPa CO2). All data are presented as means ± SEM, n= 5-10. Within each experimental group, RCR did not vary significantly between the different assay temperatures (0, 6, 12°C), whereas between the experimental groups the mean RCR of the 0, 6 and 12°C assays were significantly reduced in both cold and warm hypercapnia acclimated animals compared to the control group (Table 3). There was no difference in the Q10 values for mitochondrial state III respiration in the acute assay temperature range from 0-12°C between the different acclimation groups. * indicates a significantly different RCR compared to control N. rossi. In the warm hypercapnic group, COX activities in liver were decreased compared to the control at all temperatures. 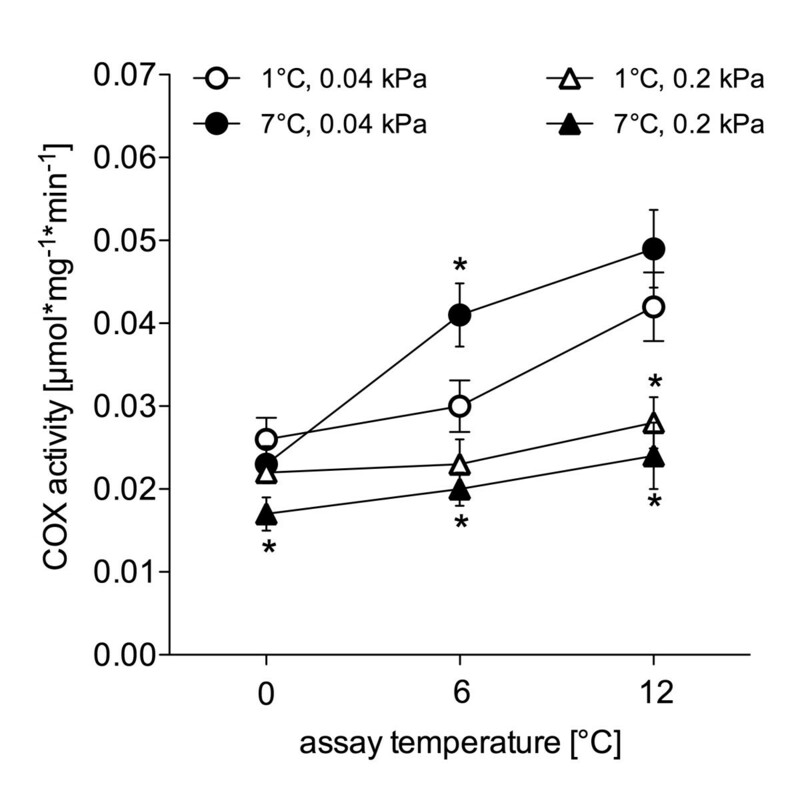 A similar trend was apparent in the cold hypercapnic animals, but only significant in the assay at 12°C (Figure 3). COX activities in liver extracts of the warm normocapnic group were significantly higher than in the control group at the 6°C assay. Cytochrome c oxidase (COX) activity in liver extracts of long-term acclimated N. rossii . Open circles: 1°C, 0.04 kPa CO2 (control); filled circles: 7°C, 0.04 kPa CO2 (warm normocapnic); open triangles: 1°C 0.2 kPa CO2 (cold hypercapnic); filled triangles: 7°C 0.2 kPa CO2 (warm hypercapnic). * depicts a significantly higher/ lower enzyme activity of the respective acclimation group compared to control, at the given assay temperature. Activity values are given as means ± SEM in μmol*mg-1*min-1, n= 4-7. The pHi of muscle tissue of the control N. rossii was 7.33±0.07 (n=3) (Table 4). The highest, though not significant deviation from the control group was found in the warm normocapnic animals (0.08 pH units lower). Liver pHi was lower than the respective muscle pHi in all treatments, control pHi of liver tissue was 7.08±0.03 (n=3). In parallel, liver P CO2 in all acclimation groups was significantly higher than muscle P CO2. All acclimation groups showed muscle tissue [HCO3-] elevated above controls ([HCO3-] = 3.99±0.41 mM), up to 6.72±0.66 mM (n=5) in cold hypercapnic specimens and 6.85±0.37 mM (n=10) in warm hypercapnic individuals. Data are presented as means ± SEM. Superscript letters indicate following significant differences: a – sign. different to control conditions, b – sign. different to temperature & CO2 acclimation. c –sign. different to temperature acclimation (t-test, ANOVA, p≤ 0.05). Liver [HCO3-] was generally higher than in muscle samples. [HCO3-] in liver under control conditions (9.21±0.37 mM, n=3) was slightly lower than in the cold hypercapnic group (10.11±1.19 mM, n=5) and the warm hypercapnic group (10.35±0.72 mM, n=7). These data have to be considered with caution, as due to sample shortage (most liver tissue was needed for isolation of mitochondria) there was only one liver sample available for pHi estimation in the warm normocapnic group, however, with a value similar to those in the warm hypercapnic group (n=7). Visualisation of the intracellular acid–base parameters in a pH-bicarbonate diagram (Figure 4) illustrates that in liver tissue, changes in acid–base status of the cold hypercapnic group changed in parallel to the assumed non-bicarbonate buffer line of controls; only in the warm normocapnic N. rossii was the resulting value located distinctly below the non-bicarbonate buffer line of controls. In white muscle, the CO2 induced acidosis in both cold and warm hypercapnic groups was compensated for by a significant rise in [HCO3-], resulting in values close to the P CO2 isobar of ~ 0.95 and 1.15 kPa CO2, respectively. pH i / [HCO 3 - ] (Davenport) diagram of intracellular pH (pH i ) and acid–base parameters. Values of liver and white muscle homogenates of control (1°C, 0.04 kPa CO2) and warm normocapnia (7°C 0.04 kPa CO2), cold hypercapnia (1°C, 0.2 kPa CO2) and warm hypercapnia (7°C, 0.2 kPa CO2) acclimated N. rossii (c.f. Table 4). All data are given as means ± SEM, n= 1-7. The solid line marks the non-bicarbonate buffer line (βNB) for white muscle, the dashed line for liver. βNB value was adopted from VanDijk et al. for the Antarctic eelpout P. brachycephalum. Cold hypercapnia acclimation did not significantly affect pHe, which was 7.44±0.06 (n=9) under control conditions (Table 4). pHe was significantly higher in the warm hypercapnic group (7.51±0.04, n=10) than in the warm normocapnic (7.32±0.05, n=9) group. None of the acclimations significantly affected extracellular P CO2, however, changes in bicarbonate result as a consequence of CO2 enrichment from 1.2 to 1.4 kPa in warm and from 1.2 to 1.5 kPa in cold acclimated animals. Cold hypercapnia acclimation was in fact associated with a significant increase in bicarbonate levels ([HCO3-] control: 8.05 mmol*l-1, cold hypercapnic 11.28 mmol*l-1). In contrast, blood [HCO3-] of the warm normocapnic animals was significantly decreased (6.31 mmol*l-1). 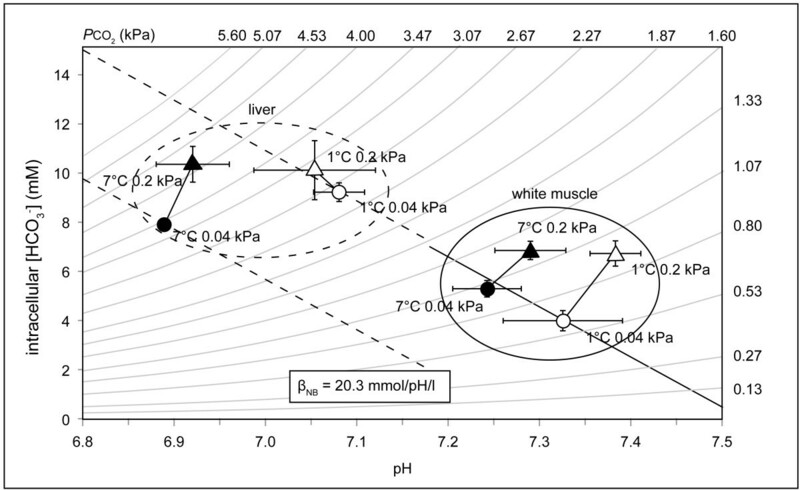 When displayed in a pH-bicarbonate diagram (Figure 5), together with the blood buffer line βNB of 30.3 mmol*pH-1*l-1 which we measured for N. rossii at 0°C, it becomes obvious that long-term hypercapnia acclimation involves a marked accumulation of [HCO3-], resulting in elevated steady state levels. pH e / [HCO 3 - ] (Davenport) diagram of the extracellular acid–base variables. Acid–base parameters are depicted for control (1°C 0.04 kPa CO2) and warm normocapnia (7°C 0.04 kPa CO2), cold hypercapnia (1°C, 0.2 kPa CO2) and warm hypercapnia (7°C, 0.2 kPa CO2) acclimated N. rossii (c.f. Table 4). The dashed line marks the in vitro non-bicarbonate buffer line (βNB), curved lines represent P CO2 isopleths. All data are presented as means ± SEM, n= 5-10. During acute warming, the RMR of N. rossii increased as a result of rising metabolic rate with a Q10 of 3.1 (Figure 1), which is consistent with previous studies on acute thermal responses of different Antarctic fish species [11, 26, 66, 67]. A part of the increase in metabolic rate can likely be attributed to the high costs of the low capacity cardio-vascular system to meet the increasing metabolic oxygen demand, which has been demonstrated for Antarctic eelpouts [13, 68]. Due to limited cardiac scope and increased friction of the vascular system at high blood flow rates, sufficient oxygen delivery at warm temperatures result in a relatively higher workload for the heart. A compensation of cardiac scope during long-term acclimation may alleviate this to some extent, contributing to a lower RMR and Q10 of 2.3 after warm acclimation (Figure 1), which indicate a partial, incomplete compensation of RMR in N. rossii (type 3 after Precht ). The same effect occurred in the long-term warm hypercapnic acclimated N. rossii, providing evidence that the partially compensated RMR in the warm hypercapnic fish was exclusively induced by temperature and not by elevated PCO2. Following long-term acclimation of N. rossii to higher temperatures and P CO2, animal condition displayed pronounced changes. While control values of HSI and condition factor were within the same range reported recently for N. rossii caught in Potter Cove, King George Island , they were reduced in warm and hypercapnia acclimated N. rossii, although the fish were fed to satiation (control HSI 1.83, condition factor 1.69, warm hypercapnic HSI 0.81, condition factor 1.5; see Table 2). This reduction may be attributed to a reduced aerobic scope caused by elevated RMR (see above) at the high acclimation temperatures chosen. The fact that the warm-acclimated fish could not completely compensate their RMR to a level comparable to the control animals could indicate beginning limitations in the circulatory system of N. rossii and in oxygen supply to tissues. As a result, the aerobic scope for the SDA response (specific dynamic action) [70, 71] might be limited at warmer temperatures. Consequently, fish may not be capable to ingest sufficient food over time to meet the required energy demand and to sustain basal metabolic rate, even if fed ad libitum. To maintain RMR elevated in warmer water, energy stores such as liver fat may be mobilized , resulting in the observed lower HSI and condition factor (see above). The paradigm that Antarctic fish have limited acclimation capacity because of their thermal specialization has been challenged by several studies reporting compensatory adjustments of whole animal respiration, cardiovascular response and blood viscosity at elevated temperatures [11, 16, 24, 66, 73]. Most of these studies focused on the cryo-pelagic fish P. borchgrevinki or on several Trematomus species. In N. coriiceps, the congener of N. rossii, an acclimation-induced shift in critical thermal maxima (CTmax) was observed, but the increase was small compared to the shifts observed in other Antarctic species (e.g. P. brachycephalum, Gobionotothen gibberifrons, T. pennellii and T. hansoni, see Bilyk and DeVries  for further details), further corroborating our conclusions for N. rossii. In general, the measurement of RMR provides a suitable indicator of a species’ thermal tolerance, as limits in oxygen consumption can reflect the onset of whole animal oxygen limitation and associated limitations in circulatory capacity . Nevertheless, the precise determination of aerobic limits under increased temperature and P CO2 benefits from the combined study of several indicators including enzyme and mitochondrial capacities, the limiting factors in ATP supply. The mitochondrial state III respiration of the control group rose continuously with rising experimental assay temperatures of 0, 6 and 12°C. The RCR values were stable between 0 and 12°C (see Table 3), indicating efficient mitochondrial coupling up to 12°C. 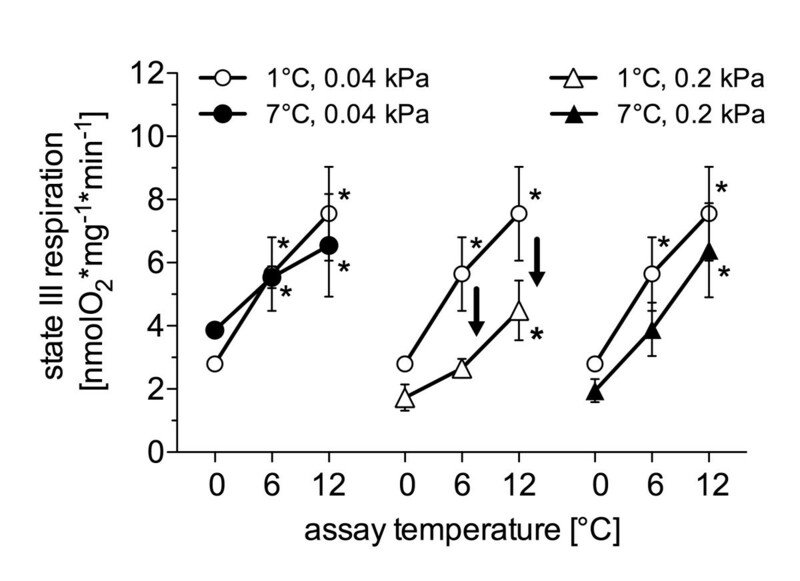 A decrease in Q10 from 2.4 (range 0-6°C) to 1.6 (range 6-12°C), indicates that state III respiration became less responsive to temperature at higher assay temperatures, and led to a similar decrease in mitochondrial scope as reported for N. rossii and Lepidonotothen nudifrons beyond 9°C. In contrast to the elevation of RMR in the warm normocapnia acclimated N. rossii, maximum mitochondrial respiration rates were not significantly higher than in the control group (Figure 2). This was reflected in similar values of RCR (control: 4.6±0.8, warm normocapnia: 4.0±1.0) and Q10 between these two groups over the whole range of assay temperatures (Q10 from 0 to 12°C, control: 1.6; warm normocapnia: 1.8) (see Table 3). Only the trend towards a reduced thermal slope of mitochondrial state III respiration of the warm normocapnic fish (linear regression analysis of state III respiration from 0 to 12°C assay temperature; warm normocapnic: slope 0.22 [(nmol O2*min-1*mg-1)*1°C], control group: 0.39) could point towards a beginning compensation of mitochondrial respiration. The partial (type III) compensation at the whole animal level (RMR, Figure 1) could therefore originate at the mitochondrial level, possibly underpinning relevant adjustments of the cardiovascular system. Interestingly, cold hypercapnia acclimation led to significantly reduced state III respiration at acute assay temperatures of 6°C and 12°C compared to the control group, accompanied by a significantly reduced mean RCR over the whole range of assay temperatures (Table 2). Similarly, state III respiration was depressed in the warm hypercapnia acclimated N. rossii, below that of the control group (Figure 2), and showed significantly reduced RCRs, indicating a clear effect of elevated ambient P CO2 on mitochondrial metabolism. This effect did not translate into a change in whole animal RMR but may reflect a decrease in tissue and whole animal aerobic and functional scope. In contrast, a down-regulation in resting aerobic metabolic rate occurred under acute hypercapnic acidosis in muscle tissue of the invertebrate Sipunculus nudus, reflecting a reduction in ATP consuming processes of maintenance metabolism (e.g. anabolic/ catabolic protein metabolism) [75, 76]. Such energy savings might also occur in fishes and affect proteins involved in mitochondrial respiration (e.g. reduced citrate synthase activities in hypercapnia acclimated Sparus aurata), thereby causing a lower state III respiration. Since state IV respiration remained unchanged after cold or warm hypercapnia acclimation (data not shown), the reduced coupling capacities were likely caused by the reduced state III respiration (per mg mitochondrial protein) and not by increased proton leak rates. The reduced COX activities (per mg cellular protein) (Figure 3) in the liver of both cold and warm hypercapnia acclimated N. rossii support this hypothesis and are in line with the projected changes in protein activity, including possible modifications in the mitochondrial membrane. The differences observed at the mitochondrial level only partially reflected the whole animal level (see Figure 1), specifically in that the mitochondrial studies exclusively concentrated on liver tissue, which only constitutes a fraction of whole animal metabolism. A possible whole organism consequence of such capacity limits in mitochondrial metabolism under conditions of elevated energy demand (e.g. activity, reproduction) may be shifts in metabolic pathways  and a decrease in aerobic scope under long-term elevated P CO2. Further alterations may include a reduction in growth or behavioural capacities under long-term increased P CO2, as observed in coral reef fish (Amphiprion percula & Neopomacentrus azysron) [77–79]. The changes in mitochondrial capacities may be related to shifts in extra- and particularly intracellular acid–base status. The liver pHi in control N. rossii of this study (pHi 7.08, Table 4) were similar to values recorded for the eelpout Z. viviparus (pHi 7.06, ). The pHi values of the white muscle samples (e.g. control group; pHi 7.325) were close to values reported for Antarctic and non-Antarctic fish in other studies (e.g. G. morhua 7.34, ; P. brachycephalum 7.42-7.43 , Harpagifer antarcticus pHi 7.36 at 1°C , 7.33 N. coriiceps). In the warm normocapnia acclimated group, white muscle values followed the α-stat pattern , with a lowering of pH with increasing temperature by −0.014 pH units/°C. Such a rise in body temperature also caused a linear drop of pHi in white muscle of the North Sea eelpout Z. viviparus (−0.016 pH units/°C) . The illustration of intracellular acid–base parameters in the pH-bicarbonate diagram (Figure 4) emphasizes a defence of liver pHi by the non-bicarbonate buffer system (such as proteins or amino acid residues) in the cold hypercapnia acclimated fish, in similar ways as recorded e.g. for G. morhua or freshwater catfish Liposarcus pardalis. In the liver of the warm hypercapnia acclimated N. rossii (Figure 4), pHi was compensated by intracellular HCO3- accumulation, in parallel to the findings in the blood (pHe) and muscle pHi. This compensation of chronically increased P CO2 of both cold and warm groups may have contributed to the observed shifts in metabolic steady state towards slightly alkaline pH values. The long-term reaction to acute changes in acid–base status may include shifts in the use of metabolic substrates by favouring oxidative decarboxylation of dicarboxylic acids (malate, glutamate/ aspartate) [75, 84]. These reactions could help to reduce the elevated proton load under chronic elevated P CO2, thereby playing an important role in the buffering of changes in the acid–base status. Nevertheless, such modifications appear to be insufficient to maintain full mitochondrial capacities in N. rossii, paralleled by the observed reduced COX activities and RCR of the cold/ warm hypercapnic mitochondria. During long-term elevated ambient P CO2, CO2 enters the mitochondria by diffusion, yielding an increase in proton and [HCO3- levels. Taking into account the pH and total CO2 gradient maintained between mitochondria and the cytoplasm under control conditions, liver mitochondrial [HCO3- of the warm hypercapnic animals were up to 10 mmol/l higher than in the warm normocapnic group (or 4 mmol/l in the cold hypercapnic group compared to their controls); calculated after [47, 85]. Earlier studies of the acute effects of alkaline pH and increased [HCO3- on liver mitochondria revealed inhibitions in the TCA-cycle , thereby lowering mitochondrial respiratory capacities and their capacity to supply ATP. In trout (O. mykiss) hepatocytes, acutely increased [HCO3- at 1 kPa P CO2 also depresses mitochondrial metabolism via interruptions in the TCA-cycle, possibly caused by alterations in citrate and phosphate transport . Intracellular acid–base regulation is supported by the respective adjustments in extracellular acid–base status, e.g. the accumulation of extracellular bicarbonate during compensation for the respiratory acidosis . The same shift in ‘set points’ towards alkaline values observed at the intracellular level occurred in the blood. In contrast to other pHe values recorded for temperate marine fish (e.g. cod 7.95 , flounder 7.78 , seabream 7.65 ), the extracellular pH of N. rossii was quite low in the present study (pH 7.44 in the control group). A study by Egginton  revealed a low blood pH of 7.5 for N. coriiceps directly after capture, which increased to 7.7 over 96 hours during recovery from landing stress. In cannulated N. coriiceps pHe increased from 7.5 to 8.0 during recovery, a value consistent with the blood pH of 8.01 measured for N. rossii by Egginton et al. . pH values measured in the present study may be lower than these values due to ‘grab and stab’ effects, as the cannulation of animals was experimentally not possibly. Nevertheless, these handling effects should have affected measurements in all experimental groups in similar ways and thereby still allow for comparison between the different acclimation groups. As expected for marine teleost fish (e.g. 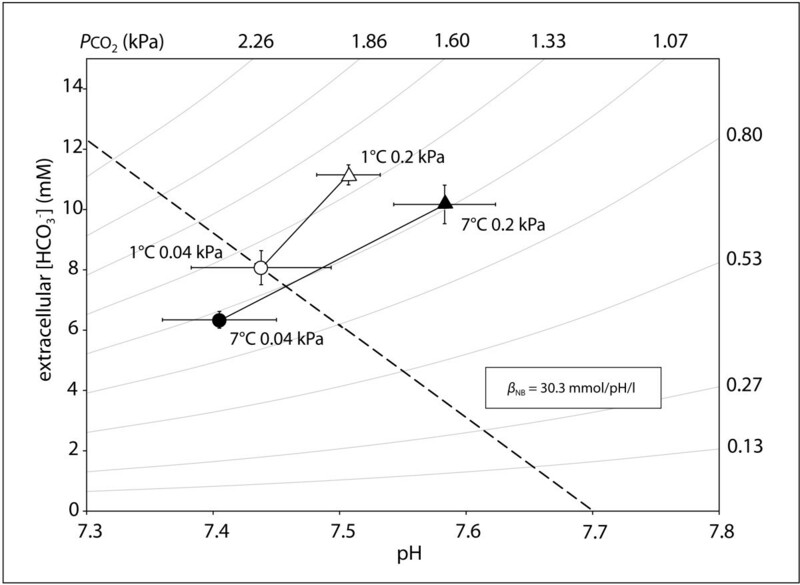 Conger conger, G. morhua or Sparus aurata), the acute acidosis evoked by higher environmental P CO2 was compensated for by a significant increase in plasma [HCO3- in both the cold and warm hypercapnic groups. The depiction in the pH-bicarbonate diagram (Figure 5) shows that the increase in plasma [HCO3- cannot solely be attributed to extracellular non-bicarbonate buffering. Instead, combined acid–base parameters were positioned above the non-bicarbonate buffer line, likely due to the involvement of proton equivalent ion transfer processes . Although the pattern of compensation is similar for many teleost fish, the [HCO3- reached differ between species: e.g. levels reached 22 mM in C. conger, and 32 mM in cod, respectively  when exposed to 1 kPa CO2. The exposure to a moderate P CO2 of 0.2 kPa led to lower but still significantly elevated [HCO3- of 11.3 mM in cold hypercapnic N. rossii. The compensation of higher ambient P CO2 via elevated [HCO3-e and [HCO3-i can lead to an increase in ATP demand for ion exchanging processes to maintain [HCO3- at this higher level, as it was reported for long-term hypercapnia acclimated eelpout (Z. viviparus) . The reaction to this constantly higher ATP demand could be a shift in energy budget with reduced ATP consuming processes, e.g. protein turnover or anabolism . 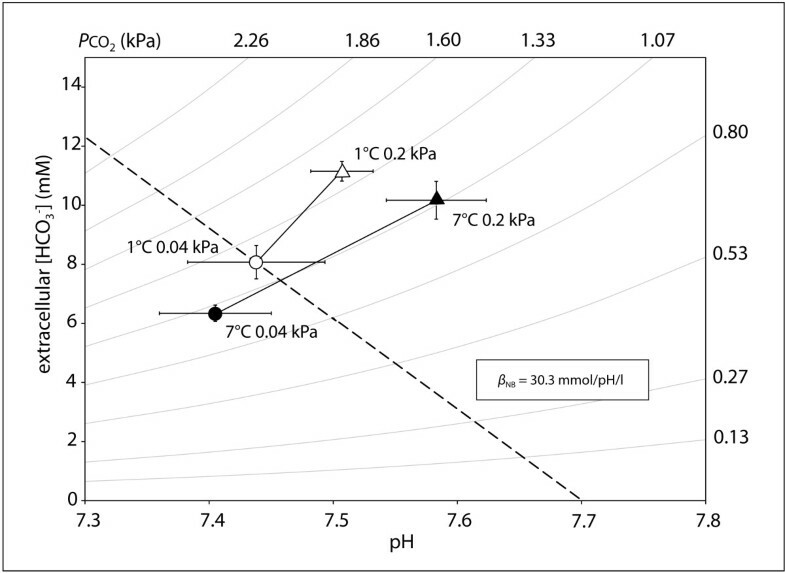 This new metabolic equilibrium under increased metabolic demands for acid–base regulation could result in shifted ‘set points’, as we observed in the warm or cold hypercapnia acclimated N. rossii, with pH shifted towards alkaline values and thus a constant, slight metabolic alkalosis in both groups. Both temperature and hypercapnia influence blood parameters in Antarctic fish, which has been demonstrated for blood osmolarity after thermal acclimation in notothenioids . This explains the observed decreased serum osmolarities in our warm acclimated animals. The unaffected osmolarities in cold hypercapnia acclimated N. rossii are in line with earlier findings by Larsen et al. for cod (G. morhua) exposed to 1 kPa CO2. Although we observed hypercapnia induced changes in ion regulation, the higher [HCO3-e in the blood are too small to significantly alter total osmolarity. Hence, the changes in osmolarity can exclusively be attributed to long-term warm acclimation. The haematocrit levels of N. rossii were unaffected by warm and/ or hypercapnia acclimation, and within the range reported for its sympatric sister species N. coriiceps[26, 95] (Table 2). While acute warming causes an elevation of haematocrit in red-blooded notothenioids , long-term warm acclimation leaves haematocrit levels constant, consistent with results from other studies on Antarctic notothenioids . Thus, the oxygen carrying capacities of the blood of warm and/ or hypercapnia acclimated N. rossii do not seem to be limiting under these conditions. It has been assumed that the extracellular non-bicarbonate buffering is mostly accomplished by proteins in the blood , and thus strongly depends on haematocrit , which varies greatly between fish species, also among Antarctic fish species [26, 28, 98, 99]. The haematocrit levels measured in N. rossii (28–31, see Table 2) thus result in high blood βNB values (30.3 mmol/l pH). Similarly, the red-blooded Antarctic fish Dissostichus mawsoni and P. borchgrevinki showed higher βNB values (~28 and 18 mmol/l pH, respectively) than the haemoglobinless icefish Pagetopsis macropterus (βNB ~3 mmol/l pH) . Some possible limitations in oxygen availability may have occurred at the intracellular level in the warm normocapnia acclimated fish, where liver pHi was lower than in the control group. This pH difference cannot be exclusively attributed to α-stat regulation , as pHi changed by −0.032 pH units/°C. Possibly, the high acclimation temperature of 7°C led to limiting oxygen supply to the liver tissue as a consequence of elevated metabolic demand,, resulting in a slight contribution of anaerobic metabolism and thereby lactate production, thus shifting the pHi of the warm normocapnic group to acidic values. Nevertheless, other tissues with lower metabolic loads than liver, such as white muscle, may still be able to metabolise anaerobic end products to some degree, allowing the animals to survive at these warmer temperatures (4–6 weeks acclimation time in this study). We did, however, not observe elevated lactate values in the blood of warm normocapnic/ hypercapnic fish, and the generally low lactate values of N. rossii were similar to those measured in N. rossii and N. coriiceps earlier [28, 101]. Only in the cold hypercapnia acclimated animals, lactate levels were slightly elevated, but are likely the result of minor handling stress and do not originate from a beginning anaerobic metabolism in the liver, as they are still close to the levels of 1 mM reported for N. coriiceps under natural conditions [26, 90]. A higher ATP demand under conditions of elevated temperature in combination with an intracellular acidosis might shift or even impair liver functionality over a longer time-scale in the warm-acclimated animals (normocapnia/ hypercapnia), which could relate to the reduced HSI in the animals of the present study (see Table 2). This study investigated the thermal plasticity and acclimation abilities to higher temperature and P CO2 levels of the Antarctic teleost fish N. rossii, by studying metabolic responses at different organisation levels (whole animal, blood, cellular and mitochondrial level). At the whole animal level, our findings reveal partial compensation of RMR in the long-term warm normocapnia and hypercapnia acclimated fish in comparison to acute warm (7°C) exposed N. rossii. Long-term acclimation to 0.2 kPa CO2 had no effect on RMR. In the mitochondria, we observed only limited compensation of state III respiration following normocapnic warm acclimation. In contrast, both warm and cold hypercapnia acclimation led to reduced mitochondrial capacities, possibly mediated by changes in the TCA-cycle or the whole mitochondria, as indicated by reduced enzyme capacities. In cold and warm hypercapnia acclimated fish, we observed shifts in the ‘set points’ of acid–base regulation to more alkaline values at both extra- and intracellular levels, mediated by actively accumulated [HCO3-]. These shifts may be involved in the hypercapnia-induced changes in cellular and mitochondrial energy demand. During long-term hypercapnia, shifts towards oxidative decarboxylation processes may maintain new acid–base equilibria. As the reduced mitochondrial capacities of the cold and warm hypercapnia acclimated fish were not visible in whole animal respiration, N. rossii might be limited in energy supply and aerobic scope for e.g. activity, growth and reproduction. In the context of other data available for other high-Antarctic notothenioids [16, 73], our data suggest that among the notothenioids the cold-adapted N. rossii will have only a moderate scope for acclimation and tolerance towards ocean acidification and warming of the Southern Ocean. At the chosen temperature of warm acclimation (7°C), the liver function of N. rossii may shift or become disturbed, thereby likely reducing whole animal performance over longer time-scales. This work was supported by the Deutsche Forschungsgemeinschaft DFG grant PO 278/13-1 to AS, HOP and FCM, and a ERASMUS scholarship to EL. We wish to thank the crew of the Jubany Base (Carlini) on King George Island for their valuable technical support. AS and FCM designed the study, carried out the animal capture, acclimation, mitochondrial respiration experiments and extracellular acid–base determination and drafted the manuscript. AS performed the data analyses and interpretation. SB carried out the intracellular acid–base determination and contributed to writing the manuscript. EL performed the enzyme measurements. KM participated in the coordination of the study and contributed to revising the manuscript. HOP participated in the study design and substantially contributed to writing the manuscript. All authors read and approved the final version of the manuscript.